At the end of the day, the most pressing question on everyone's mind is this: What's for dinner? Luckily, we've featured some amazing family dinner recipes this year, and some even better copycat recipes from restaurants! We recapped some of the great clone recipes of 2011, as chosen by you, to narrow it down to the best of the best cool dinner recipes. From the best side dish recipes, to some amazing yet simple main dish recipes, this list of Dinner Menu Ideas, Recipes, and More has it all! All of the mouth-watering menu items in this Top 10 list were among the most popular copycat recipes from restaurants featured in our eNewsletters this year. We must say, you've chosen some really cool dinner recipes to try at home! This collection of "restaurant recipes recreated" has every course covered. We've got the best side dish recipes from Cracker Barrel and Red Lobster, tasty starters from Olive Garden and Bennigan's, and some simple main dish recipes from KFC and White Castle, all here in one list for your culinary convenience! You'll never lack for a family dinner recipe again with options like these! Prep your palate for the entree ahead with one of these starter restaurant recipes recreated. Whether you're a soup or salad person, we've got great clone recipes to suit your fancy. These starter recipes are so yummy, you might have trouble saving room for the rest of the meal! Olive Garden Salad with Homemade Dressing - Olive Garden's incredible house dressing is king among great clone recipes for salad dressing! Panera Creamy Potato Soup - Whether the prelude to a meal or the main act itself, this five-star soup is sure to satisfy. 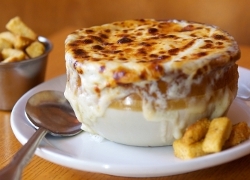 Bennigan's Onion Soup - This rich, buttery soup is sinfully good and one of the best restaurant recipes. Recreated for your cooking pleasure, this family dinner recipe will impress any and all dinner guests. Bennigan's Ultimate Baked Potato Soup - Topped with bacon and Cheddar cheese, this potato soup couldn't get any better. It's all about the main course! These amazing yet simple main dish recipes were some of this year's most popular dinner menu ideas. Recipes like these save you some money and make the whole family happy! 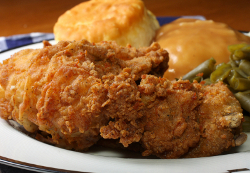 KFC Fried Chicken Recipe - A standout fan favorite, this classic copycat recipe for Kentucky Fried Chicken is extra crispy and extra delicious! Get southern-style cooking from the comfort of your own kitchen. White Castle Hamburgers - If you're looking for cool dinner recipes your kids will love, this copycat recipe for White Castle sliders will definitely do the trick. Copycat Chicken Casserole from Cracker Barrel - Cracker Barrel restaurant recipes recreated, like this chicken casserole, are the ultimate in comfort food. A meal is not complete without some delicious side dishes, and we've got some of the best side dish recipes around right here! These great clone recipes would complement any entree to perfection. 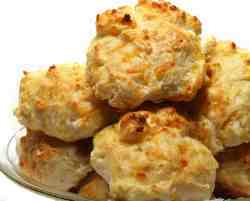 Biscuits a la Red Lobster - One of the most coveted copycat recipes from restaurants, these Red Lobster biscuits have amazing texture and flavor. Quick Buttermilk Biscuits - This is a family dinner recipe you'll use again and again. They're like the Pillsbury kind, but better! Cracker Barrel Old Country Store Corn Bread Dressing - This simple recipe is a classic copycat side dish that never disappoints.